For the last six years, I have published a daily image on Tumblr under the banner of the Cosmic Inspiro-Cloud. This started out as a collection of images that I wanted to keep for easy reference – a sort of Pinterest before its time – but I developed a curiosity about the popularity of certain images and the lack of appeal of others, measured through Tumblr’s notes system. I was also aware that many people from a planning background – including some that I work with – find many of these images rather challenging (grim, depressing, cheerless). Many of them lie well outside the boundaries of acceptability for many practitioners – or perhaps many can’t see how these images connect with practice. 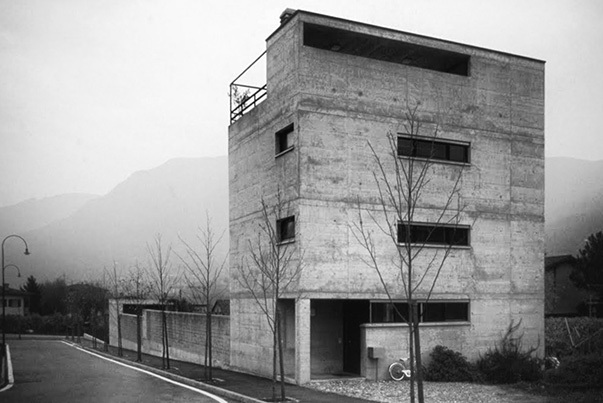 This is especially the case with images featuring the recurring themes of concrete, brutalism, modernism, Le Tiers Paysage or Terrain Vague. 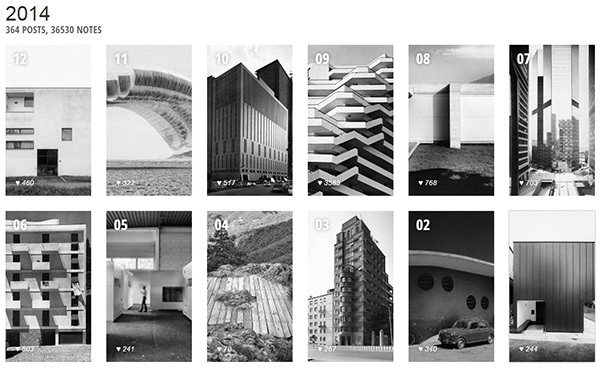 The most popular theme for the year was September’s theme of Hybrids and Brutalism featuring mostly American commercial architecture from the 1960s and 70s. This was followed by Sculptural form, blank boxes and fenestration during October, again featuring many American commercial buildings from the 1960s and 70s. 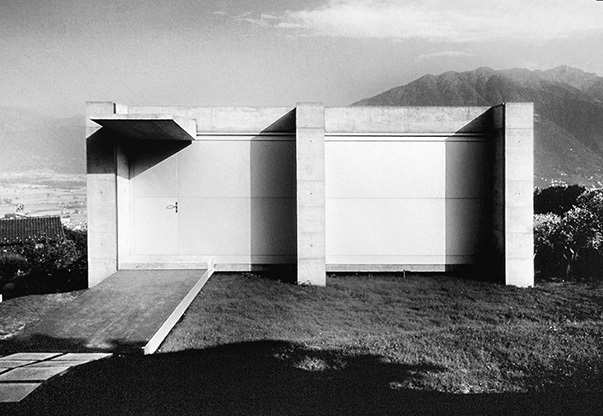 These were followed by a collection of Glass and Steel buildings during July and from June in fourth place, a collection of images from the book ‘Italy Builds’ by G E Kidder Smith. These four themes increased the number of Tumblr notes made on the site by a factor of four on 2013. Although the Cosmic Inspiro-Cloud always had a Twitter feed and a Facebook page, since December all images are now published as native Twitter images rather than just a link to the Tumblr page – so if you are interested you might find it easier to follow the Twitter account. Rather predictably, the landscape designs of Gilles Clément occupied last place over the year with a mere 526 notes. It is possible that the millisecond attention span of the Tumblr user is immediately impressed by striking architectural images than more reflective landscape compositions although some research would claim that the demographics of Tumblr users suggest they are young and incredibly engaged. Tumblr’s emphasis on multimedia blog posts means users spend a fair amount of time creating and digesting what’s on the site. The relatively low positions of the Asmara collection (February) and the Huts, Cabins and Tiny Buildings (May) was a disappointment and a surprise, as was the poor response to the work of Ignazio Guardella. Commercial architecture from the 1960s and 70s seemed to have enormous appeal in 2014 occupying first, second and third places by month. 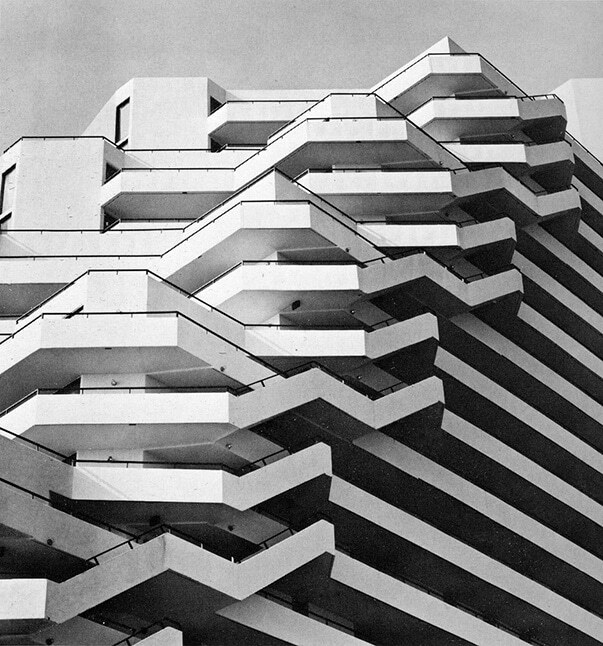 The most liked single image of the year was William Morgan Architects’ Pyramid Condominium Apartments, Ocean City, Maryland from 1971 with 3585 notes (likes) followed by Livio Vacchini’s Casa Costa Vacchini in Tenero-Contra, Switzerland from 1993 with 768 notes. 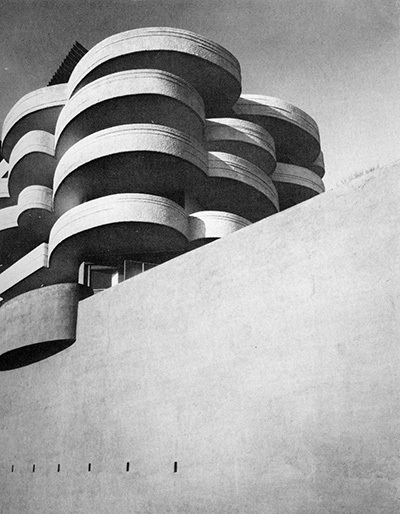 Third place went to Luigi Moretti’s San Maurizio Condominium Apartment Block in Rome from 1962 with 720 notes. If you want to look at the range of work published in 2014 on the Cosmic Inspiro-Cloud perhaps the easiest starting point is the Archive page which sets out the publications by month in a masonry grid.